On 16 March 1926, Henry O’Neil de Hane Segrave blasted down Ainsdale Beach at Southport, England and set a new Land Speed Record (LSR) at 152.33 mph* (245.15 km/h). The speed was only 1.57 mph (2.53 km/h) faster than the previous record, set by Malcolm Campbell on 21 July 1925, and Segrave knew his record would not stand for long. What Segrave needed to achieve a truly impressive speed was a car designed especially for the LSR. Segrave was born in the United States (US) to an American mother and an Irish father. He was raised in Ireland and England, and was a pilot in the First World War. He became a race car driver after the war and drove Sunbeam-Talbot-Darracq autos to many victories. The Sunbeam Motor Car Company found Grand Prix racing too expensive and quit competing in 1926. By 1927, Segrave had left auto racing completely to focus solely on setting land speed records. Sunbeam had previously provided Campbell and Segrave’s LSR cars. These machines were little more than modified Grand Prix racers. Louis Hervé Coatalen was the managing director of Sunbeam and understood how speed records would translate into auto sales. Coatalen knew that a specially-designed LSR car would be able to achieve much higher speeds than the current record. Coatalen also knew that such a car could be built fairly inexpensively by utilizing many of the unused parts at the Sunbeam factory. Coatalen agreed to build a special LSR car for Segrave, and their target was 200 mph (322 km/h). The Slug being tested at the Sunbeam works. The steel guards over the tires and chain can be seen. Many pipes were needed to bring in cool water and take away hot water and exhaust. The front engine’s four magnetos can be seen between the front tires. 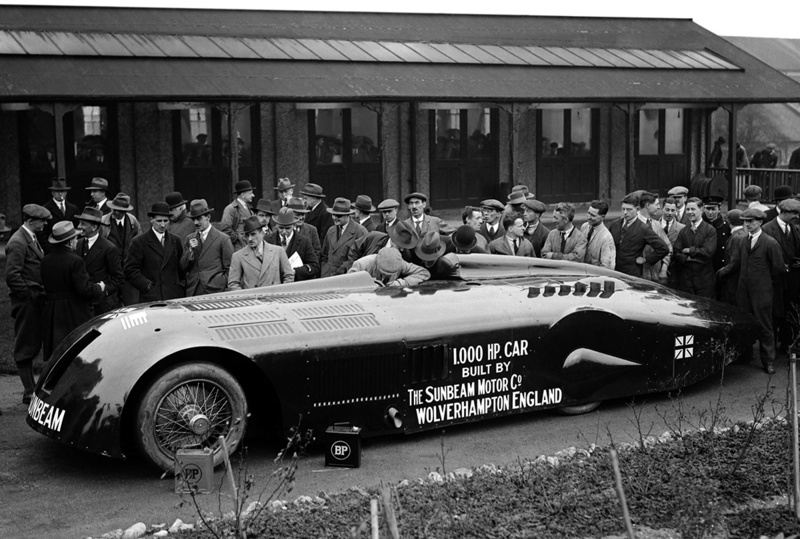 The new LSR car was designed by John Samuel Irving in 1926 and built by the Sunbeam works in Wolverhampton. Its frame and crossmembers were made of channel-steel. Two Sunbeam Matabele aircraft engines would be used to push the car to 200 mph (322 km/h). Coatalen had originally designed the V-12 Matabele engine around 1917. The engine had a 4.80 in (122 mm) bore and a 6.30 in (160 mm) stroke. Total displacement was 1,370 cu in (22.4 L), and the engine produced around 450 hp (336 kW) at 2,000 rpm but could be overrevved to 2,200 rpm. The two engines in the car had actually been salvaged from the four used in the Maple Leaf VII powerboat, which sunk during the 1921 Harmsworth Trophy Race on the Detroit River in the United States. Although each of the two engines produced only 450 hp (336 kW), the racer was officially called the 1,000 HP Sunbeam. As the car was constructed, the workmen dubbed it The Slug due to the shape of its body. When the car arrived in the US, the American newspapers called it the Mystery S. Perhaps it is most appropriate to combine all the names and call it the Sunbeam 1,000 hp Mystery Slug. The driver sat in the middle of the car and was offset to the right. One engine was installed in front of the driver and the other behind. The front engine had a single radiator in the car’s nose, and its exhaust was expelled through a single stack on each side of the car. Louvers covered the front of the car to let the heat from the front engine escape. The rear engine had two radiators, one on each side of the car, positioned behind the driver. Cooling air was brought in through ducts on both sides of the car and escaped out an opening in the car’s tail. The rear engine’s exhaust was expelled through 12 stacks that protruded behind the driver. When first shown to the press, the Slug had wheel covers over its rear tires. These were removed for the record run. Note the louvered scoop for the rear radiator. Airflow proved inadequate, and a larger scoop was fitted. Segrave is looking into the car. The engines were installed back-to-back and were linked by a common shaft. The rear engine was started with compressed air. Once the rear engine was running, it was clutched to the front engine via the common shaft, which started the front engine. With both engines running, the common shaft locked the engines together to keep them at the same rpm. A three-speed transmission took power from the common shaft and drove a cross shaft. A sprocket and chain on each end of the cross shaft delivered power to the rear axle. The transmission actually stepped up the speed of the cross shaft over the speed of the common shaft, but the chain drive acted as a gear reduction, bringing the final drive ratio to 1.02:1. The Slug had a theoretical top speed of 212.5 mph (342.0 km/h) with the engines turning at 2,000 rpm. The Slug’s innards were covered by a streamlined aluminum body developed after wind tunnel tests at the Vickers Aviation Department. To keep the driver safe, the frame was reinforced around the cockpit, and thick steel guards were installed around the drive chains and tires. A .25 in (6 mm) thick steel underbody was installed that allowed the Slug to slide along the ground if a tire failed. Covers were originally fitted over the rear wheels, but these were removed for the record runs. The 35 x 6 in (635 x 152 mm) tires were specially designed by the Dunlop Rubber Company and guaranteed to last 3.5 minutes at 200 mph (322 km/h). The tires would be changed after each record run. In the tail of the car, behind the rear engine, was a 28 gallon (106 L) fuel tank. The 1,000 HP Sunbeam had a wheelbase of 11 ft 9 in (3.58 m) and a track of 5 ft 2 in (1.57 m). The car was 3 ft 7 in (1.09 m) tall and over 23 ft (7.01 m) long. The Slug had 7 in (178 mm) of ground clearance and weighed around 7,790 lb (3,533 kg) empty. 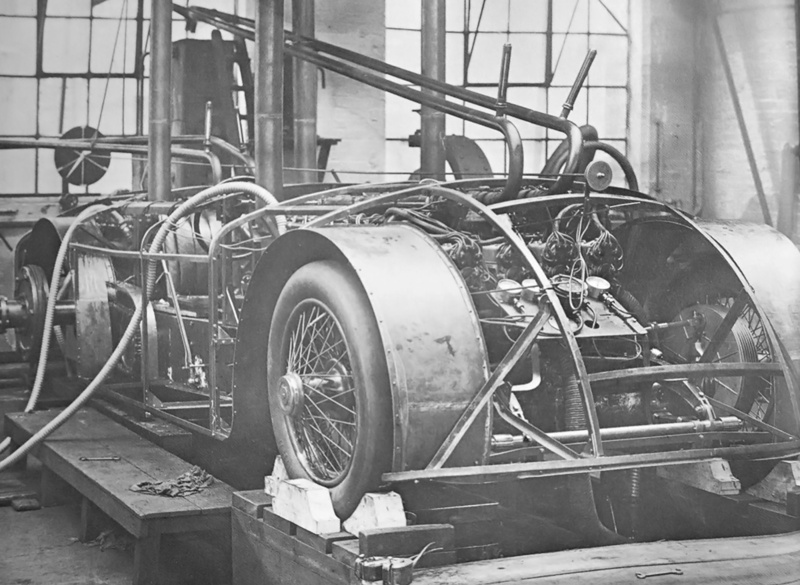 Once assembled, the car was run on a special test rig for six hours to resolve any issues. 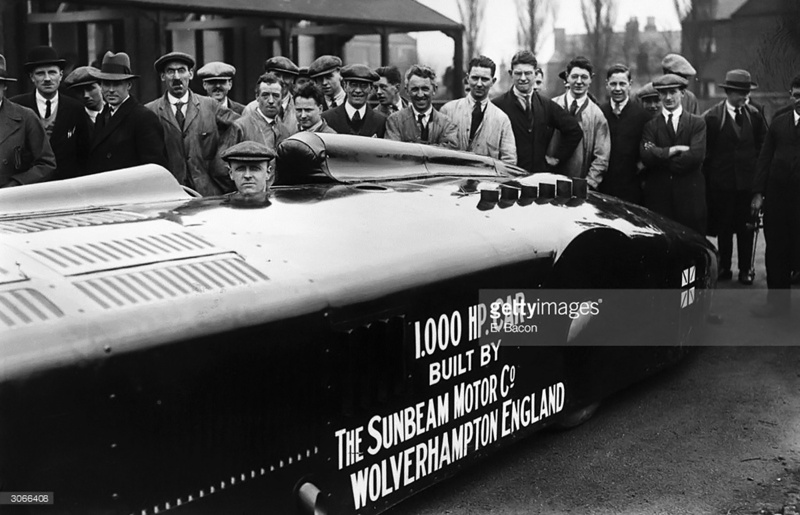 The 1,000 HP Sunbeam made its official debut on 21 February 1927. Segrave realized there was no place in Europe to safely run the car and made plans for a record attempt at Daytona Beach, Florida. Some of the car’s backers were unhappy about the runs being planned outside of Britain and forced Segrave to personally make his own arrangements to ship the car and travel overseas. Segrave rose to the challenge and got the Association Internationale des Automobile Clubs Reconnus (AIACR) to recognize the attempts which would be overseen by the American Automobile Association (AAA). This required much negotiation between the AIACR and the AAA. Segrave, his crew, and the Slug left for the US in February 1927. Segrave’s earlier LSR has been beat on 28 April 1926** by John Godfrey Parry-Thomas at 170.624 mph (274.593 km/h) in his racer Babs. Campbell regained the record on 4 February 1927 with a speed of 174.224 mph (280.387 km/h) in his new Blue Bird racer. While attempting to win back the record, Parry-Thomas was killed on 3 March 1927. At the time, a chain was thought to have broken free and killed Parry-Thomas. As a result, Segrave decided to thoroughly inspect his chains throughout his record runs. Segrave stands by the Slug on Daytona Beach. The larger scoops for the rear radiator have been installed. The rear wheel covers have been removed, and wheel discs cover the spokes on the rear wheels. The removed cover behind the rear engine gave access to the fuel tank. At the front of the car, part of the underbody is visible. Segrave and the Slug’s first test run was on 21 March 1927. The Daytona Beach course featured four miles (6.4 km) to accelerate, one measured mile (1.6 km), and four miles (6.4 km) to slow the car. This was the first time the car was driven for any real distance. Other than being difficult to steer and the rear engine getting hot, the car performed well on its rather sedate trips along the beach. A new steering box was installed, which required some modifications to the car. Larger scoops were added to the Slug’s sides to draw more air into the radiators for the rear engine. The biggest issue Segrave encountered was with the thousands of spectators who turned out to watch and got in the way of the car and the time measuring equipment. The car’s next run was on 24 March, and higher speeds were attained. More police were present to help control the crowds, but they were still an issue. With increased crowd control and no technical issues to overcome, the decision was made to make a serious attempt at the record. On 29 March 1927, Segrave set off to the north, determined to get every bit of speed he could out of the Slug. Reportedly, 30,000 spectators were on the beach that day. Fighting against the wind, Segrave hit some marker flags that lined the prepared course, but he pushed on and flew through the measured mile (1.6 km) in 17.94 seconds, averaging 200.669 mph (322.945 km/h). Letting off the throttle, Segrave found that the Slug did not decelerate as quickly as he had anticipated. Nearing the end of the course, he hit the brakes hard only to have them melt. Segrave then drove the car into the sea along the shore to slow it down and regain control. Given the cleanliness of the car, this image was probably taken before the record run. Note how the removal of the wheel covers chopped off “CAR” and “ENGLAND.” The large rear radiator scoops must have created a fair amount of drag. The car was prepared for its second run: tires were changed, new brakes were installed, and fuel and water were replenished. A short time later, Segrave ran the Slug with the wind to the south. With the engines hitting 2,200 rpm, Segrave blasted through the measured mile (1.6 km) in 17.39 seconds, averaging 207.016 mph (333.160 km/h). With a little more control that in his previous run, he brought the car to a safe stop at the end of the course. 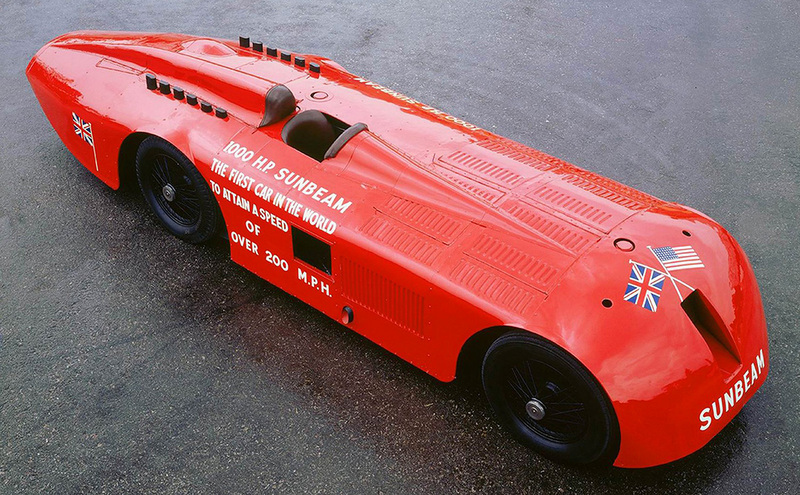 Segrave and the Sunbeam 1,000 hp Mystery Slug had set a new LSR of 203.793 mph (327.973 km/h)—an astounding 29.569 mph (47.587 km/h) faster than the previous record (Campbell’s). Segrave and the Slug’s record run represented the first time the 200 mph (322 km/h) mark was exceeded. Segrave was the first non-US citizen to make a record attempt at Daytona Beach. Likewise, the 1,000 HP Sunbeam was the first non-US car to make a record attempt at Daytona Beach. The Slug ushered in a new era of large, streamlined machines designed solely to break the LSR. Segrave and the Slug are seen racing down Dayton Beach on the second (south) record run. The marker flag is similar to those that Segrave hit on his first pass. The relative positions between the photographer and the flag give a sense of how narrow the course was. 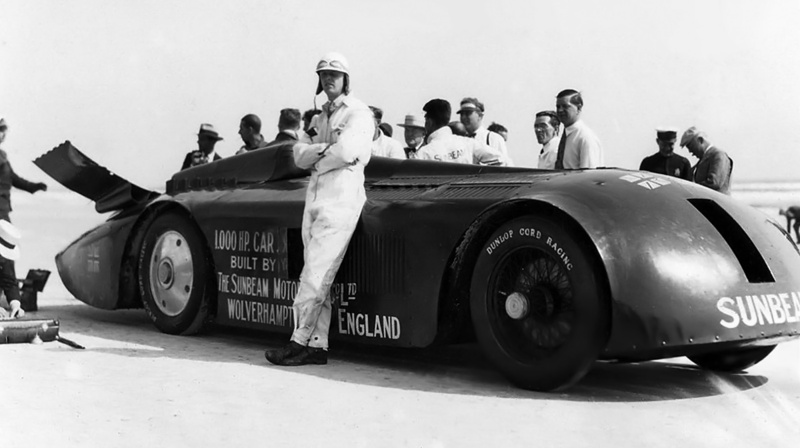 Segrave’s record stood for less than a year before Campbell bettered the speed by only 3.163 mph (5.090 km/h). At the time, Segrave was busy working on a new LSR car, the Golden Arrow. The Slug’s one outing in Florida had gained the record but had also shown that the car’s chain-drive was antiquated and that its second-hand engines could be improved upon. 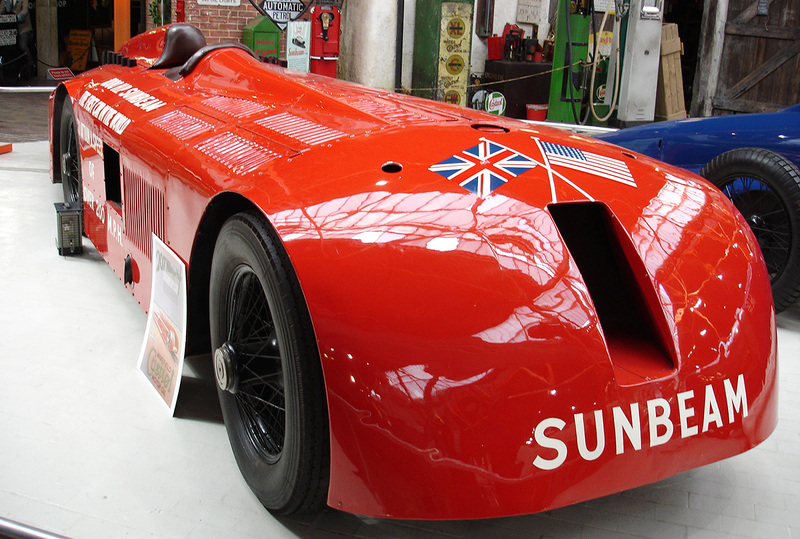 The Sunbeam 1,000 hp Mystery Slug was preserved and eventually made its way to the British National Motor Museum in Beaulieu, Hampshire, United Kingdom, where it is currently on display. The car has been driven approximately 75 miles (120 km) under its own power. *Segrave’s 152.33 mph (245.15 km/h) record was over 1 km (not 1 mile) and was officially recognized by the AIACR. The speed had already been exceeded by Tommy Milton, who drove his twin-engine Duesenberg-Milton racer to a recorded speed of 156.046 mph (251.132 km/h) on 27 April 1920. Milton’s car caught fire during the first run, and he was unable to make a return pass. Milton’s speed was recognized by the AAA as a US record, but it was not recognized by the AIACR as an international record. ** Parry-Thomas actually broke Segrave’s record on 27 April 1926 at a speed of 168.074 mph (270.489 km/h). Parry-Thomas then set a new record the following day. This entry was posted in Automotive and tagged Land Speed Record on 5 September 2017 by William Pearce. What a work of art! Encasing a divine piece of ultimate machinery! Somehow this car and its attempt at the LSR is so much more exciting and romantic than the F1 races of today. Insane speeds are expected at F1, but pioneering attempts like these have so much more of a spirit of adventure and daredevil artistry! How I wish I had been on the sidelines while the LSR was being attempted, it sure would beat being in the F1 grandstands!